For a special Waitangi Day colouring card, print out our picture of the signing of the Treat of Waitangi onto printer card, colour in and fold in half. This colouring page shows (our interpretation) of the signing of the Treaty of Waitangi on 6th February 1840. Please note - we do not claim historical accuracy! 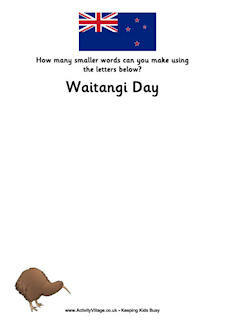 Join in the fun on Waitangi Day with this Waitangi Day party colouring page for younger children!